September 27, 2017 (San Diego) -- Congressman Issa (R-Vista) took part in a hearing before the House Oversight and Government Reform Committee yesterday, examining nuclear waste storage policy and solutions that would allow nuclear waste, like that from the San Onofre Nuclear Generating Station (SONGS), to be moved out of our communities. May 30, 2017 (San Diego) – Your Internet provider can now legally sell your browsing history and your email address, without your consent—thanks to legislation signed into law by President Trump. The measure passed the Senate by just 2 votes and the House by 10 votes. San Diego Republican Congressmen Duncan Hunter and Darrell Issa both voted for the measure – after taking $19,000 and $66,275 from the telecommunications industry respectively. 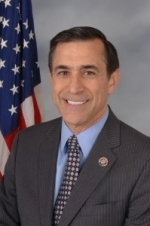 March 1, 2017 (San Diego) -- Rep. Darrell Issa on Monday clarified his stance on a review of Russian ties to President Trump, apparently backing off his recent call for a special prosecutor. January 3, 2017 (San Diego) – San Diego Republican Congressman Darrell Issa has introduced the Midnight Rules Relief Act, or HR 21. If approved, it would make it easier for Congress to undo regulations issued in the final weeks of President Barack Obama’s administration.